Probably like many of you I was totally excited when I discovered the wonderful work of India Flint - what an inspiring person! The beauty of her books is amazing and I still soak it in whenever I feel empty or dissatisfied. 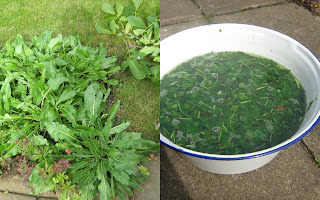 So one sunny day I rushed into the garden, harvested all my woad and started, after having searched for long an easy recipe for this medieval technique without fermentation and having to use strange ingredients like human urine. But I failed... probably in the last step. The dye did.not.turn.blue.at.all. In the meantime I gathered some walnut leaves and rolled it to a bundle, where I had hidden the last woad leaves (in the picture below) put it into al glass filled with water and boiled it for a while. What a surprise when I opened it - at least some blue stains are visible, together with the brown of the walnut leaves the form a pretty structure.